Burbank, CA – This weekend, in the true spirit of Lucha Libre (Mexican Wrestling), El Rey Network's Lucha Underground was proud to donate the outfit of one of its most celebrated fighters, Pentagon, to be the first wrestling uniform inducted into the Martial Arts History Museum, which has now opened its doors to include wrestling in martial arts history. On had for the festivities was El Rey Network's president and general manager Daniel Tibbets. “The El Rey Network has made such an impact in the martial arts world. From their Lucha Underground program to their Thursday night Kung Fu movies, it has brought more awareness to the arts,” says museum president Michael Matsuda. Pentagon's outfit, which will be on permanent display at the museum, is a representative to the great silver masked wrestler Santo El Enascarado de Plata who is considered as the “Father of Luche Libre” because of the impact he made in Mexico and throughout the world. “Masks like the one worn by Pentagon is very symbolic to the silver mask first worn by Santo. I grew up on Santo and we are honored to have a descendent of that great past in Pentagon's outfit,” adds Matsuda. As part of the unveiling, one of the greatest panels of Lucha Underground were assembled to provide a Q&A discussion about the show and what it took for them to create it and the fighters that helped bring it to new heights. They included Chris DeJoseph, Eric Van Wagenen and Skip Chaisson. 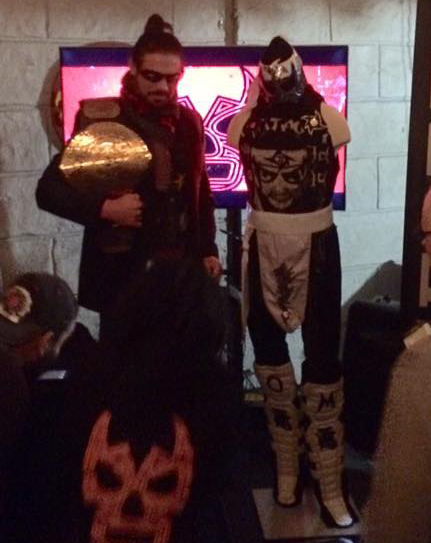 As a plus to the panel, two of Lucha Underground's greatest fighters were in attendance. They included first Lucha Underground champion Johnny Mundo and up and coming fighter Rickey Reyes. The fans of Lucha Underground also enjoyed viewing next week's episode before being released to the network. “Lucha Underground has some really great fans and they are just wonderful people who really love the show. I was honored to have them be part of the event and hope they will continue to support El Rey Network and now the Martial Arts History Museum,” adds Matsuda. Hosting for the event included Johnny La Quasto, film director Art Camacho and Matsuda. For information about Lucha Underground, please visit their website at LuchaUnderground.com. For information about the Martial Arts History Museum, visit their website at Mamuseum.org. The museum is located at 2319 W. Magnolia Blvd., Burbank, CA 91506.